All American Portable Air recently introduced a new 10 to Roll and Cool DX unit to its inventory fleet. The 120,000 BTU unit operates on 208v/3p/50A power and contains a digital thermostate which controls both heat and air. The unit is 5'4" W, 8'2" L and 5'10"H and weighs 1000 pounds. 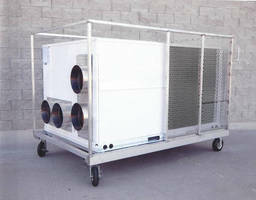 The unit sits on four foam filled pneumatic casters and rolls easily through most doors. It is a great unit for tent and event parties and other events.